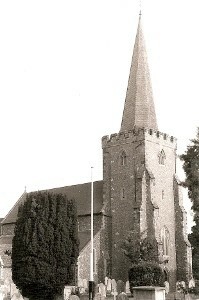 A large church, with a C13 nave and aisles and a late C14 or C15 chancel and tower. There are C14 stalls and mosaics by W Butterfield. West Tarring retains something of its village past. The parish was a peculiar of the Archbishops of Canterbury, who had a palace here; the surviving part, now a parish hall, looks C15. This connection probably explains the size of the church, which is mentioned as one of two in Domesday Book (2, 9), the other being almost certainly St Botolph, Heene, then a chapelry. However, no part of the present one is older than the C13 nave. Most aisle windows are lancets and though they are renewed, Nibbs shows that most follow old lines. The internal sills are linked by a string-course and their segmental rere-arches appear later C13. One north one is unusually close to the east wall, but this is not an error and André (1 p56) plausibly suggests it was placed there to give more light, primarily to an adjacent altar. A C13 south doorway with stops now opens into a vestry and though mostly renewed, the shafted north doorway has a moulded head and head-stops. Enough old-looking flintwork remains in the east wall of the north porch to suggest it too is C13. The five-bay arcades have round piers and abaci on octagonal bases, a combination that points to the later C13. The fine carved stops have foliage, except one head to the south. The clerestory lancets are placed over the piers with tall rere-arches and steeply sloping sills. A few timbers of the crownpost roof may date from this time. All the detail of the chancel is later C14, but it is shorter and lower than usual for that date and may be on earlier foundations. A single tiebeam of the roof appears to be contemporary. The five-light east window of panelled tracery is related to that at Poynings, which is known to have been started after 1368 and which shared a parson. Both have a sexfoil over the centre light and at the apex and the uppermost lobes above the side-lights are shaped to fit. The side-windows have simpler panelled tracery. The tower was added last. Its plain but good proportions, with battlements, angle-buttresses and a square stair-turret, recall Kentish examples, though the tall broach spire is more typical of Sussex. It is early C15, but elements look back to the C14, notably the pointed north and west bell-openings with ogee heads; the others are square-headed. The openings of the ringing chamber are trefoiled. The west window of panelled tracery was renewed c1981 (vidi) in place of a C19 replacement of a C18 wooden one (1 p55). The C15 tower arch has a double-chamfered head with foliage stops and semi-octagonal shafts on the responds. The north aisle had a two-light east window (Hussey p295), which went in the C19; the south aisle may have had one too. The Sharpe Collection drawing (1804) shows probably C18 timber windows in the tower and south aisle, which had a dormer for a gallery. Adelaide Tracy drew the church in 1853 (II p127) in the course of the restoration, for though it had only started that year, the tower west window is as today. There has been some question about the authorship of that restoration, for there are actual or near contemporary references to both J Peacock (ICBS) and W White (Hunter p264, citing various sources) as architect. However, a report in the Gentleman’s Magazine, (January to June 1854 pages 517-18) describes in detail the restoration (cited as GM) and names Peacock as the responsible architect. This seems conclusive, particularly in view of his previous local connections and the fact he is also named in the ICBS papers covering the actual period of work. It may be that White provided estimates but was unsuccessful in obtaining the work. A sum of £2575 12s 0d was raised by subscription (Parliamentary Paper XLVIII p188 – my thanks to Martin Jones for this reference), which would have covered all the work, assuming this actually cost £2200 as stated at the time (GM ibid); the roofs of nave and aisles were replaced,with tiles in place of the Horsham slabs outside, and also most external detail, including the east windows of both aisles. Dating from the same time is a vestry. The chancel was not restored at this time (B 18 p517) and only ‘necessary repairs’ were carried out (GM ibid). which aroused the displeasure of the incumbent who put up a notice criticising the poor efforts of the Ecclesiastical Commissioners, said to be responsible for maintaining the chancel. The disproportionately low chancel arch, which matches the height of the nave arcades, is certainly C19 though nothing is known about its predecessor. 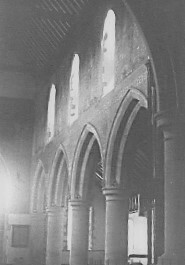 Work on the chancel arch is not mentioned in the GM report nor in Peacock’s specification of the work to be done in the parish papers in WRSO (information from Edmund Harris). It therefore seems likely that it belongs to the full restoration of the chancel which started after the advent of a new rector, Henry Bailey, in 1878 though the presence of glass dated 1860 (see below) in the east window suggests either earlier work or that the condition of the chancel was better than was made out. The architect was Bailey’s friend, W Butterfield, though Paul Thompson (p450) suggests he himself started only in 1882. Butterfield’s work was relatively gentle, including the retention of the Horsham slabs on the roof. Unsurprisingly in view of Peacock’s earlier work. it appears to have been largely confined to the chancel with the exception of the mosaics, which he placed in the nave (see below) in 1886. Altar rails: Early C17 with turned balusters and shallow carved decoration. Chest: C13 iron-bound and dilapidated. Font: C19 octagonal on eight marble shafts. Its rather severe and massive appearance might seem to point to the hand of Butterfield, but Edmund Harris suggests that the description of Peacock’s new font in GM is so reminiscent of this one as to suggest that it is his work. It is said to be derived from its predecessor, which had been drawn in 1853 by Adelaide Tracy (II p28), though that had lost its shafts. This is said to have gone to Melbourne Cathedral (Peat and Halsted p159), though it is not mentioned on the cathedral’s website. No date for the donation is known, but Butterfield may well have been involved (in which case the old font was kept after the 1854 restoration).since he was also the architect of Melbourne cathedral, the foundation stone of which was laid in 1880, around the time he was working here. 1. (East window) T Baillie and Co, 1860 (www.stainedglassrecords.org retrieved on 29/3/2013). 2. (West window) T Baillie and Co, 1863 (B 21 p812). 3. (South aisle, first to fourth windows) T Baillie and Co, 1864 (B 22 p551). Like other glass in the church these have been subjected to the barbarous process of ‘pickling’, entailing the removal of the backgrounds. 4. (North and south chancel windows) Clayton and Bell, 1878-82 (CDK 1882 pt 2 p163). 5. (South aisle, east window) Lavers and Barraud, 1859 (www.stainedglassrecords.org retrieved on 29/3/2013). 6. (South (sic) aisle, east window) T Willement, 1854, costing £31. (Lucas/Good Samaritan and Feeding of the Multitude) (Willement ledger, confirmed by GM). This cannot be identified and it seems unlikely that this glass was replaced within five years (see immediately above) so some error is likely. 7. (North aisle, first to third windows) T Baillie and Co, 1867 (KI), ‘pickled’. 8. (North clerestory, second and third windows) T Baillie and Co, 1874 – also ‘pickled’. 9. (Both aisle west windows) Cox and Barnard, designed by P O Chapman, 1958 (WSRO Fac 1849). Monument: (Churchyard) Martha Chilvers (d1807). By E Coade and Sealy in their artificial stone. It consists of a square base with angels at each corner, surmounted by an urn (A Kelly p192). Mosaics: (Nave) 1886, by W Butterfield (BN 51 p114), and inspired by those in S Appollinari, Ravenna. Between the clerestory windows are the twelve Apostles, with heads of Old Testament Patriarchs in the spandrels. Rediscovered cartoons show a Christ in Glory was intended for the space above the chancel arch (CT 12 March 1999 p28). The makers were Burke and Co of London, using Italian craftsmen (Thompson p460). Discoloured by dirt and decaying, renovation was completed in 2006. 1. (South aisle) Large late C13 with a trefoil head. It has two drains, one trefoil-shaped, the other like a quatrefoil. Pulpit: According to GM, Peacock designed a new pulpit (and reading desk) of carved oak. This corresponds to the present one, though it is impossible to be certain they are the same. Royal Arms: (Aisle) Elizabeth II, dated 1953. Screen: Late C14. Unusually low, with traceried openings and doors and iron spikes on top. If these are original, the screen was separate from the roodloft, but they could be post-Reformation. Stalls: (Chancel, east side of screen) Late C14, arranged in collegiate fashion. Of the six misericords, two have heads and the remainder foliage. My thanks to Edmund Harris, who has undertaken research into Joseph Peacock and who drew my attention to the report in the Gentleman’s Magazine quoted above.